- August 7th, 2018, 10:11 am #555041 Is anyone taking the lead on this fall as commish? The season is just around the corner and I have an A League title to defend. For the record, I am going to be overseas most of the next month so I am not volunteering to be commish. - August 8th, 2018, 10:38 am #555096 you should get an email about it. - August 8th, 2018, 3:26 pm #555110 I think I'm in? i just got the email and i see the time of the draft. i didn't really click on anything. I hope i'm in. 2015 & 2016 Flamefans Fantasy Football Champ. - August 8th, 2018, 4:28 pm #555112 I'm in. FlamesFans Fantasy Champion: Football A League 2011, B League 2014; Basketball 2013; Baseball 2018. - August 9th, 2018, 8:50 am #555123 yeah yahoo has made this auto renew terrible easy but too easy to the point where you aren't quite sure everything is done that needs to be done. all i had to do was pick a draft day/time. - August 9th, 2018, 7:34 pm #555147 I’m in again. - August 10th, 2018, 1:06 am #555159 Ugh, won't be able to make the draft. That's always one of my favorite experiences. - August 10th, 2018, 1:16 am #555160 In. Sly Fox wrote: Ugh, won't be able to make the draft. That's always one of my favorite experiences. that was just a made up time. i'm down for some negotiation here. luminary and ffg i'm assuming you guys are fincastle and vick in a box. just verify that. - August 10th, 2018, 10:30 am #555180 Fincastle is jbock... anyone friends with him on Facebook or something? - August 10th, 2018, 10:48 pm #555225 Nope, I'm Johnny U.
JBock is Fincastle. He indicated earlier in the thread that he's in. - August 11th, 2018, 2:50 pm #555246 I am doubting that I will be a in a position to be part of the draft. I am overseas the next three weeks in Australia & Indonesia. I am essentially the AM/PM opposite of ET + 1 hour that week and the week prior in Jakarta. I am back on US soil starting the 31st but will be headed to Bangkok & Melbourne likely on 9/6 for a week or so. In other words, if it works out for me to be in the draft, great. Otherwise don't sweat it. - August 19th, 2018, 5:44 pm #555610 Yup I’m Fincastle. - August 27th, 2018, 2:49 pm #556103 Are we still doing draft tonight? - August 27th, 2018, 2:53 pm #556104 I have a calendar reminder so i don't forget. - August 28th, 2018, 9:29 am #556174 yep. there was no compelling way around sly's dilemma so i just kept it. - August 28th, 2018, 12:03 pm #556187 Sly wound up with David Johnson AND Zeke Elliott so it kind of worked for him. The draft was kind of strange, but then again I'm not a fan of auction drafts so that might be on me. A Todd Gurley going for $75 and an Andrew Luck for $1 doesn't make sense to me. - August 28th, 2018, 12:43 pm #556189 Yeah the bidding was out of control for a while there. LUminary wrote: Sly wound up with David Johnson AND Zeke Elliott so it kind of worked for him. The draft was kind of strange, but then again I'm not a fan of auction drafts so that might be on me. A Todd Gurley going for $75 and an Andrew Luck for $1 doesn't make sense to me. As the recipient of Andrew Luck for $1, I am pretty hopeful for this season. I have a pretty decent team but expect to be middle of the pack. - August 28th, 2018, 8:32 pm #556218 I admit that I was pleasantly surprised at how auto draft didn't completely bury my season before it began. Last season I had a good draft but won the league based on acquisitions during the regular season. I suspect this year's champ will follow a similar pattern. - August 28th, 2018, 10:05 pm #556231 I wanted either Gurley or Goff as a Rams fan and when Gurley came up, i wasnt gonna let him go by the board..
Postie, in his first year in the league is 3rd on the tiebreaker with Johnny U. Jbock is 5th (i match up with him this week) followed by i believe RM, then Adam, Flamerbob and rounding out the league is the other MicahK who is I believe LUconn. I think Micah is RubberMallet, but I’ve been wrong before. - October 4th, 2018, 9:16 am #559782 You would be incorrect but close ... they were LU roommates. As of the moment only two playoff spots have been secured and 4 teams are fighting for the other two with two others who could sneak in but it would take something monumental for it to happen. Liberty Flames v2.1 and MicahK's Team have clinched spots in the championship semifinals. 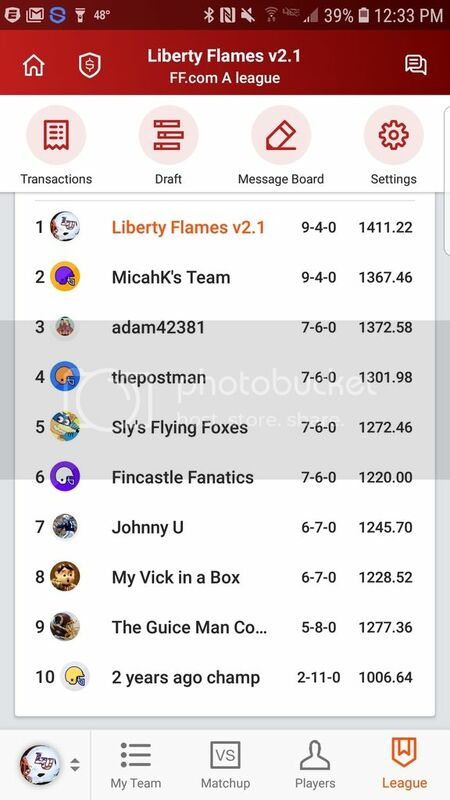 Adam42381, thepostman, Sly's Flying Foxes and Fincastle Fanatics are jostling for the other two spots, while former finalist Johnny U and My Vick in a Box both could sneak into the top 8 with wins. They also need at least two of the teams above them to lose, but with two of them facing each other in Sly and postman, the chances are going to be quite long of jumping that high, and they both need to have all time high scoring weeks to overcome the first tiebreaker. - December 10th, 2018, 12:46 am #566566 Well we still have Monday night to go but looks like the championship semifinals are set with postman and adam guaranteed wins. All that is left to decide is who will be the #1 seed. I'm guaranteed to lose thanks to the Bears defense stepping up while on my bench...and MicahK has two opposing players matching up, so FFG, im gonna be rooting for the Seattle Seahawks tomorrow night. - December 25th, 2018, 2:18 pm #568137 I was lucky to make it as far as I did.